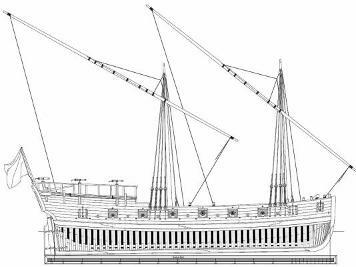 Ship Modeler Clare Hess reports on the new ship model plans recently released by the Nautical Research Guild. For the Hyde Street Pier Model Shipwrights, this is a pretty significant release given the similarities of the Galley Washington and the Cutter Lee, which ship modeler Paul Reck scratch built. Given that these plans are specifically for a plank-on-frame build, we’ll see how they are received by our group’s scratch-builders, which are predominantly plank-on-bulkhead and solid hull modelers. I received a nice surprise in the mail today when a set of plans I ordered from the Nautical Research Guild showed up. I kind of splurged for my own birthday this year and got these plans and a few other things that I’ll write about in a future post. The Washington was a galley built by General Arnold for service on the Lake Champlain in 1776. Because the prevailing winds on the lake blew along the length of the lake, she and her 3 sister ships were lateen rigged for the superior performance when sailing close to the wind. These are VERY nice plans. They are model plans and designed for the construction of a 1/4″ scale plank-on-frame model. All the frames are drawn out, taking up 4 of the 10 sheets of plans. The details are nicely done and overall, the set of plans is top notch.